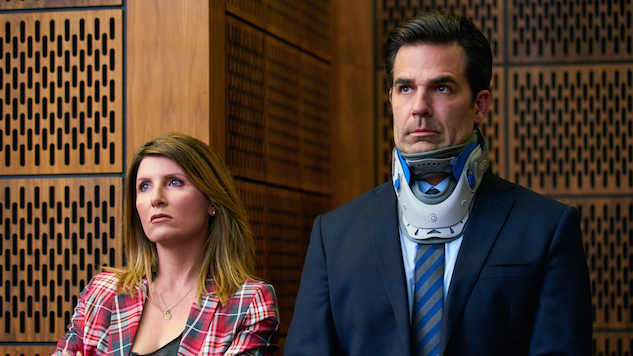 Rob Delaney and Sharon Horgan are two incredibly funny people whose close comic relationship (begun online and forged in the fires of a writers’ room) has helped them craft one of the best series on TV. Amazon’s Catastrophe, which American expat Delaney and Irish Horgan also write and produce, is about an uneven marriage kicked off by a multi-night stand and an unexpected pregnancy—and it enters its fourth and final season with all its wit and honesty intact. One of the least glamorous shows on TV, Catastrophe revels in deromanticizing love while maintaining a gritty, humanist optimism. Paste: The finale really encapsulates the series, with grief and optimism and cruelty and humor—what was the easiest part to write in such a difficult episode? Sharon Horgan: The tricky thing was figuring out the episode—like, figuring it out was harder than writing it. Once we were writing it, we were kind of in it. Rob Delaney: The easiest stuff to write was maybe Pat’s [Nat Faxon] dialogue, Pat and my dad [Mitchell Mullen]. Horgan: Oh, you know what was the tricky thing? We had such a clear story for Rob in that episode and we were very, very close to having to hand it in before we thought of the story for Sharon. Coming up with the idea that they were going to be pregnant again was kind of a last-minute hurdle. For Rob, it was coming back and we knew we wanted to meet his dad and for him to get this job offer. The eulogy, the very last scene—all of that came to us very easily, but working out what Sharon was going to be doing during the episode was trickier. Delaney: Yeah, and then we figured, wouldn’t it be just like them to get pregnant? Horgan: And also figuring out how to tell Mia’s [Carrie Fisher, who played Rob’s mom] story was hard… It was all hard. Paste: Since you two do everything else on the show, how do the pair of you work with your directors, Ben Taylor and Jim O’Hanlon? Delaney: We love to get them scripts as early as possible, because both of those guys are very story-savvy, so we’re really trying to involve them. Yeah, we might hire them, but it’s because we like how they direct. Delaney: Sometimes people want to draw it out. Delaney: Well, that’s not strictly true: The producers are always involved. Horgan: The people who put our show on the air are super creative as well. We’re lucky, because we have a lot of people we can rely on along the way. Paste: What do the producers help with after the script is done? Horgan: Holes and stuff. They help us figure out stuff. When we get to a point where we’re handing something in, but we’re not happy with it because we feel it’s not working for whatever—a bunch of reasons, one big reason. Delaney: Sharon and I always get all the credit, but our directors and producers are massively involved and we’re very grateful that they are. We’re Johnny Damon and Pedro Martinez and the director is Terry Francona. Right? That makes sense to everybody. I’m from Boston. We’re doing the stuff on the field but they know [the] plays. Paste: One of your key collaborators has been Oli Julian, who does the show’s music and its incredible theme song. How did you approach the music of the series? Horgan: We wanted it to have an Americana feel to it. Delaney: We knew really there was going to be one American person in a British program starring an Irish woman, so we wanted to bring a little stank to it. So the music, we decided. And then he invented it. Horgan: For each season it changed here and there, some is more electronic and some is more sparse. We wanted it to feel like nothing else. Delaney: I’m glad you brought that up, because off the top of my head I can’t think of another show that has a bespoke composer doing all of the music. So, anyway, Oli Julian is amazing. Paste: You have both described yourselves as cockroaches in different interviews, years apart—is this the spirit animal of Catastrophe? Delaney: The cockroach is an important animal because it endures. And it’s disgusting. I think about cockroaches because their survival isn’t even necessarily good. They just do. They just have this will to live and pull through. So, yeah, I’ve thought about cockroaches during Catastrophe for sure. Paste: Still optimistic, right? You live, and that’s something. Horgan: Who wants to be a cockroach? Paste: What was something you wanted to say in the final season you couldn’t in the first three? Horgan: We never really fully, graphically expressed that level of love. We did it in a car at the end of Season Three, but it was sort of drunk and slightly thrown-away, but a real, genuine outpouring of how happy [Rob makes] me, was something we hadn’t done before. And I think we could only do it because we’d been so awful to each other. Rob getting to the point where he told Sharon he doesn’t like her. We’ve never done that before. It was pretty brutal. Delaney: I think at the end they’re saying that they love each other. And that’s it. That doesn’t mean that everything will be OK. But it does mean that they love each other, regardless. Which is an important point the show is trying to make. The final season of Catastrophe is now streaming on Amazon Prime Video.